Researchers have provided the first evidence of a drug that shows a relatively high response rate for low-grade ovarian cancer patients. In the first-targeted therapy clinical trial for low-grade serous ovarian cancer, eight out of 52 (15 percent) patients had a complete or objective partial response (tumor shrinkage) and 34 (65 percent) had no disease progression during the two-year course of the study. “These are remarkably encouraging results for what can ultimately be a devastating disease,” paper’s senior author David Gershenson, M.D., professor in The University of Texas MD Anderson Cancer Center Department of Gynecological Oncology and Reproductive Medicine said. These patients have a median overall survival of 80 months, about twice as long as those with high-grade disease, who are typically in their 60s when diagnosed and comprise 90 percent of ovarian cancer patients. The average age of women with low-grade cancer falls in the early 40s, Gershenson said, and it’s not uncommon to see women in their 20s, 30s and 40s and the occasional teenager with the disease. 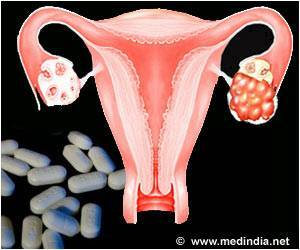 High-grade serous ovarian cancer is susceptible to chemotherapy upon relapse or recurrence. Cancer-causing genetic mutations in BRAF and KRAS genes occur more frequently in low-grade ovarian cancer, so the researchers chose a drug that targets the molecular network that includes those genes. Selumetinib inhibits MEK1/2, a critical molecule in what’s known as the MAPK pathway, which includes BRAF and KRAS. All 52 patients had received at least one previous therapy, with 30 having had three or more. Clinical trial results with selumetinib were quite satisfactory. Median progression-free survival of 11 months and 34 patients (65 percent) went at least six months without their disease worsening. Two-year overall survival of 55 percent. Median overall survival had not been reached, because more than half of patients (61 percent) remained alive at the time of data cutoff for the study. Side effects ranged from cardio and gastrointestinal toxicity to pain, fatigue, anemia and dermatological effects. Of the 52 patients, 22 had their doses reduced and 13 ultimately left the study due to side effects. Researchers obtained tumor samples sufficient for DNA analysis from 34 patients. While 14 patients had KRAS mutations and two had BRAF mutations, there was no connection between having those mutations and whether the patients responded to selumetinib. Gershenson said that the researchers will further explore the question of matching drug to mutation during a larger phase 2/3 clinical trial that he will lead with investigators from the NCI Gynecological Oncology Group and the United Kingdom. The findings are published in the journal The Lancet Oncology. This is a huge break through as this ovarian cancer kills!